With the F1 series suspended, Formula Atlantic grew back slightly in 1981, gaining an extra round and grid sizes rose slightly to an average of just under 12. It also reclaimed its 1979 champion, Ray Mallock, who had suffered a fairly disastrous season of British F1 in 1980 and returned to Formula Atlantic for 1981 with a new Ralt RT4/81. Mallock won all ten of the races that he finished, retiring in two others and skipping the other four rounds. He also won eight pole positions and set fastest laps in ten of those twelve races. Some completion came from Atlantic regular Alo Lawler, returning with his Ralt RT4/80, who took three pole positions in the early races before splitting from expert preparer Peter Harris and losing some of his competitiveness. Also in a brand new car was 1980 runner up Phil Dowsett but his March 81A did not work out of the box like the Ralts. Once the March was sorted, he finished the season as Mallock's closest competitor and won at Snetterton and at Brands Hatch in August. The Ehrlich team continued with an upgraded version of their RP5 for Ian Flux - who won at Brands Hatch on 3 May. The final race winner was David Duffield who led home a field of just five cars at the Ingliston race. See also Jeremy Shaw's season review in Autosport 17 Dec 1981 pp24-25. The points table has been constructed from the results but fastest laps are known for only 14 of the 16 races; eight for Mallock, three for Lawler, two for Dowsett and one for David Duffield at Ingliston. The results here have been compiled by Chris Townsend using Autosport and Motoring News. Not all the results are complete: in particular four starters at Silverstone 4 May 1981 are not known. Full results sheets or details of non-starters are also needed for Oulton Park 18 Apr 1981, Brands Hatch 3 May 1981, Silverstone 4 May 1981, Brands Hatch 25 May 1981, Snetterton 9 Aug 1981 and Thruxton 20 Sep 1981. Grid positions are known for about half the races but we have very few qualifying times. 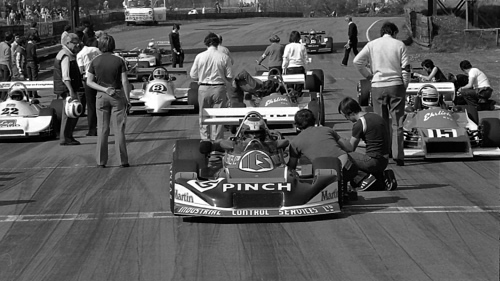 Grid sheets or details of qualifying are needed for all races except Brands Hatch 15 Mar 1981. Also needed is the Fastest Lap for the races at Brands Hatch on 3 May 1981 and 25 May 1981. Chassis identification is largely from Chevron, Lola and Ralt production records, chassis plate observations by Adam Ferrington and others, details of previous owners of second-hand cars (typically F2 cars which have been identified from F2 reports) plus some fragments of March production records. The numbering systems of the twin Ehrlichs, the Lebacq and the veteran Wimhurst are not known. The only completely unknown cars are Will Arif's Chevron B29, the Duncan Bain/Martin Mansell March 782 and the Neil Fletcher Engines March 782 or 792 of Malcolm Hull.